I thought I’d switch things up a bit today with a look at the lighter side of Pipe History and some unique and sometimes bizarre inventions that pipers have seen over the years. I’ll start off with this well-intentioned invention. We all know that pipe smoking can bring people together from all walks of life – the ritual, the camaraderie, the long discussions about just about anything that crop up over a bowl, be it briar, cob or meer. 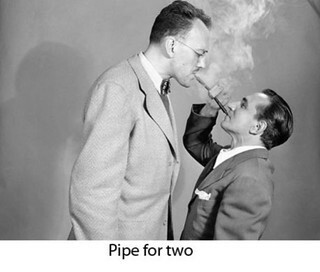 However, I think this creative pipemaker took things a bit too far with this Pipe for Two. The little guy needs to stand on a box, and I don’t know anyone who wants to be quite this up-close-and-personal with anyone while in conversation. 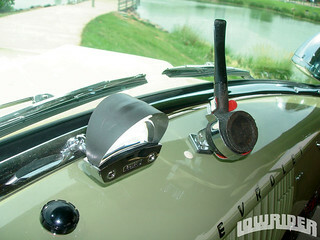 The Post-War economic boom in North America saw a huge growth in the automotive industry, and this gadget was perfect for the pipe-smoking motorist – a dash-mounted pipe holder. Nowadays, if you’re spotted with a pipe in your mouth while driving you’re more likely to get pulled over under suspicion of smoking the “other” pipe weed. I also suspect this invention wouldn’t fly today due to the huge hit to your car’s resale value that happens when it smells like an ashtray. 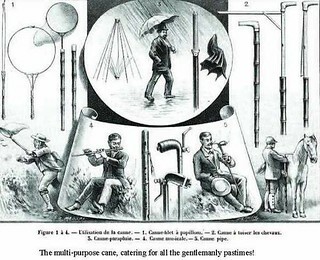 Continuing in the pipe gadget vein, here’s an interesting Victorian advertisement for a Multipurpose Cane – kind of the Swiss Army Knife of canes – which included among its several built-in gadgets a “Cane Pipe”. 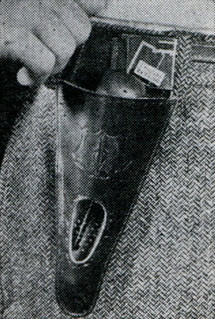 A pipe accessory still available today is the Pipe Holster. 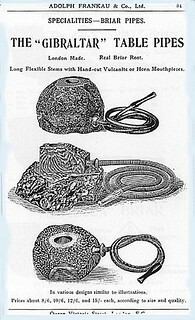 This allows the piper-on-the-go to carry his favourite straight pipe on his hip, but with one major drawback. I can see the ad copy now. “Do YOU like the taste of condensed tobacco “water” left in your pipe after a bowl of your favourite tobacco? If so, this is the pipe holder for you! The Whamco Pipe Holster drains all that liquid right into your pipe’s mouthpiece, ready for your next smoke.” Ick. Moving on, I’d like to devote the remainder of this post to an interesting historical pipe phenomenon known as the Desk or Table Pipe. 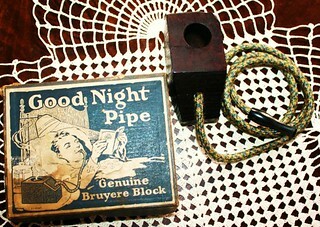 These pipes were marketed as early as the 1800’s and as recently as last year (check out Vauen’s Lounge Pipe) as the convenient, hands-free and (arguably) safer way to enjoy your favourite blend while working at your desk, reading in bed or whatever other activity you preferred to engage in, all without the (presumably debilitating) strain and fatigue of holding a traditional pipe in your teeth. 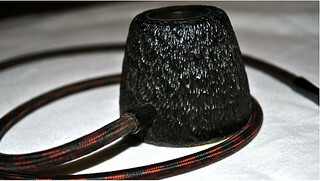 Many pipemakers got in on the table pipe action on both sides of the Atlantic. Here are some examples by Dunhill, Adolph Frankau & Co, Savinelli, Brebbia and more. The Brebbia table pipe above (last pic) is from my own collection, purchased by my father sometime in the 1960’s. 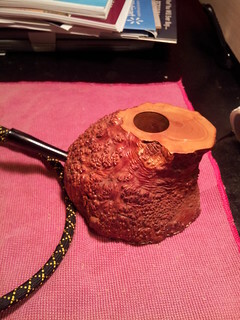 It’s a massive piece of briar with a 1” wide, 2” deep chamber that I swear holds enough tobacco to keep you at your desk for several hours. Maybe someone should pitch the idea as a way to improve productivity at the office! I’ve been poking fun at these contraptions but, humour aside, these and other pipe-related inventions help illustrate the long and creative history of pipe smoking and the shared desire among its proponents to improve and encourage the hobby. This community spirit is alive and well today, evidenced by the growth of artisan pipe makers, tobacco “micro-blenders”, local pipe clubs and a host of pipe-focused online communities that attract new members worldwide and provide a venue for intelligent discussion, the sharing of information, and the many acts of everyday kindness and mutual support for which brothers and sisters of the briar are known. Thanks for taking this little side trip through pipe history with me. More pipe restorations are coming soon. Until then, Happy Piping! This is an awesome post… I love the Desk Pipes and I might have to track one of those down or figure out a way to make one of my own. People can laugh all they want I think those are brilliant! Reblogging over on Pipe Scoundrel! Glad you like it, Clint! The desk pipes are an interesting niche for sure. I know of at least one that has been commissioned in the last year or two, so there’s still demand out there. Do you happen to know what the hose made out of? I have a few Hookah pipes is the hose similar to that or some kind of rubber? I would imagine rubber would probably taste funny. Just curious because I’m giving some serious thought to making one of these bad boys! The hose on mine was made of a flexible black rubber, wrapped in a braided outer layer. Mouthpiece and the “stem” part that fits into the briar block are plastic, though vulcanite, acrylic, etc can be used to upscale it a bit. The rubber dried out and cracked over 40 years in storage, so I replaced it with a length of poly hose I found at the hardware store. Hookah hoses tend to be little more than paper/fabric wrapped around a steel coil. Impossible to clean, IMHO, and they don’t last very long. There is probably a specific type of food-grade/surgical tubing out there that would be ideal for the task. Yeah I had to spend some money to get good hookah hoses. Most of the stuff you get with a pipe are junk. 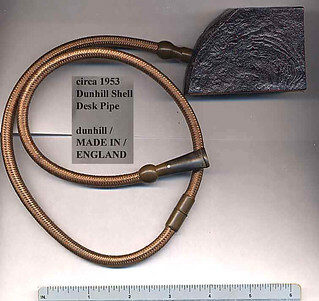 I’m intrigued by the Desk Pipe so I might do some research on this and see what I can dig up. Thanks Charles! You are most welcome! Be sure to post what you end up with. Inquiring minds want to know! An entertaining article from Dads Pipes. I need to find one of those desk pipes ASAP! Thanks, Al. I’d been coming across these tidbits here and there for a while, so I thought it was time to bring them all together in an article.